Image derivation is from the Sea Ice Index data product, which relies on NASA-developed methods using passive microwave data from the Defense Meteorological Satellite Program (DMSP) F-18 Special Sensor Microwave Imager/Sounder (SSMIS). The basis for the Sea Ice Index is the most recent version of the data set, Near-Real-time DMSP SSM/I-SSMIS Daily Polar Gridded Sea Ice Concentrations, and the most recent version of the NASA-produced Sea Ice Concentrations from Nimbus-7 SMMR and DMSP SSM/I Passive Microwave Data. The Sea Ice Index was developed with financial support from NOAA NESDIS and in cooperation with NOAA NGDC. Please note that our daily sea ice images, derived from microwave measurements, may show spurious pixels in areas where sea ice may not be present. These artifacts are generally caused by coastline effects, or less commonly by severe weather. Scientists use masks to minimize the number of “noise” pixels, based on long-term extent patterns. Noise is largely eliminated in the process of generating monthly averages, our standard measurement for analyzing interannual trends. The underlying data used to produce these images and graphs may be obtained from NSIDC. Please see the Sea Ice Index documentation for more information about the daily values, and links to the data. NSIDC produces the daily extent image and graph using a five-day trailing mean. Please note, the values provided are the individual daily values, not the five-day average values that NSIDC displays for its daily extent image and graph. An alternative daily sea ice extent product, the 4km Multisensor Analyzed Sea Ice Extent (MASIE) product, may be more suitable for your needs. 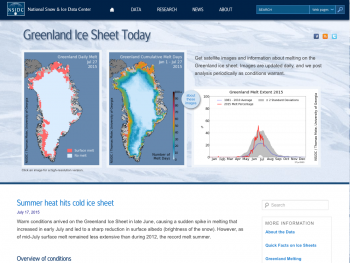 The MASIE site includes an FAQ page that explains the differences between it and the Sea Ice Index daily product. 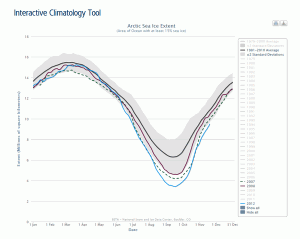 Isolated areas of missing data occasionally occur in near-real-time sea ice data. The daily extent map shows any areas of missing data as dark gray regions, speckles, or spider web patterns. However, in the time series chart we account for the missing data by averaging the extent for that region from the day before and the day after the gap, a mathematical technique called interpolation. Interpolation is an appropriate approach because ice cover changes slowly. If you have questions about Arctic sea ice data, please see our Frequently Asked Questions about Arctic Sea Ice.